For many people new to Doctor Who, it can be difficult to understand the show as a whole. While the revival has done a good job of filling in the blanks about some of our favorite monsters and species from the classic era (ie Cybermen, Time Lords, The Master, and so on) it could never fully bring all of classic Who into scope. Well fear not! Using what will become this five-part guide, you will be able to introduce yourself to the whole scope of Who without feeling like you’ve just stared into the untempered schism. The first part of the guide will focus on the first 4 of the 12 (or is it 13?) Doctors to have graced our screens. The grumpy, short tempered, and eventually mellowed out old Gramps… He who started it all. Defiant of his people’s stale and bureaucratically unchanged ways, he takes his granddaughter in hand and steals himself an older barely functioning Type-40 Tardis. Without any control of its navigation systems he dematerializes off into the universe and ends up in 1960’s England. With several companions in tow, he would introduce us to some of Who‘s greatest villains: the Daleks and the Cybermen. The character was at first rather frightening, even seemingly able to commit a murder in just his second adventure on screen. However, over time the doctor mellowed out and had a sweeter more sentimental side. None more apparent when bidding a sad farewell to his granddaughter Susan at the end of The Dalek Invasion of Earth. He would sadly meet his end fighting the Cybermen for the first time in The Tenth Planet, but would also go on to be the first Doctor to regenerate on screen. This is the one that started it all. No one knew what a success the Doctor would end up being. 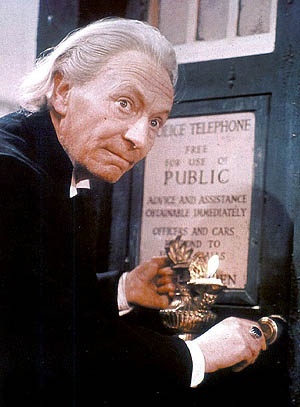 Before 1966 when William Hartnell’s health began to deteriorate, it was decided the new actor would take on the role. They decided to create the concept of regeneration and instead give the Doctor a new younger body with a wholly different personality. If you can imagine an out of work Clown with the combined intelligence and knowledge of the world’s greatest thinkers, then you have the second Doctor. Known lovingly as the Galactic hobo, the second doctor oftentimes outwitted his opponents is by appearing to be a little less intelligent than he actually was, to the bemusement and confusion of his companions. Frequently seen getting a tizzy, this doctor’s personality was a bit more chaotic than his previous inclination. Much more prone to smile, this doctor was somewhat childish in his behavior at times and all the endearing because of it. During his tenure. we see the very first introduction of the sonic screwdriver, albeit a much less flashy device at the time. Also the introduction of one of the greatest recurring characters of all: Brigadier Lethbridge Stewart and UNIT. His final serial was an epic 12 part story, where we are finally introduced to the Time Lords and their less than sympathetic attitudes, with their punishment of the Doctor for his interference in the affairs of people and time (even though they were acts of kindness and valor) through forced regeneration and exile to earth in the 1970s. The Scottish Highlander and true despiser of the British, these two made an interesting pair on screen. Some of the most amusing moments in Doctor Who history occurred between these characters. When Jamie first comes on to the Tardis, he is illiterate and a bit of a brute. However, over time he becomes a valued member of the Tardis team and a loving companion to the second Doctor. Perhaps most one of the most tragic scenes in Doctor Who is at the end of The War Games when Jamie is pulled out of the Doctor’s timeline by the Time Lords and forced back into his own timeline, thus forgetting about all the interactions, growth, and development that he underwent during his time on the Tardis. 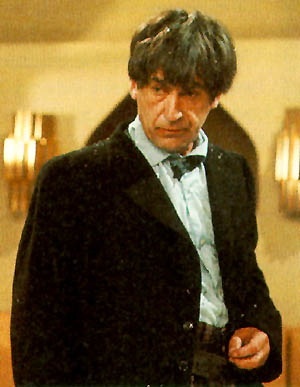 Patrick Troughton set the bar high for future doctors to come, and is often cited as an inspiration for the development of other actors who played the part. The next casting choice was straight out of the 1970s with John Pertwee coming into the role of James Bond…I mean the third Doctor. The Dandy Doctor. With a flair for the dramatic and martial arts this doctor is perhaps one of the biggest personalities of his entire incarnation. Now exiled by the Time Lords and put on earth to act as it protector, this Doctor’s memory of how to use his Tardis was almost completely wiped clean. Using it as more of a condo rather than a capsule for flying through space and time, the Doctor had to resort to other modes of transportation. As such, a variety of different motor vehicles, some even capable of hovering, were introduced to the series. This fit the new Doctor’s personality perfectly, and his wardrobe, which would make Liberace cry. Eventually for the show’s 10th anniversary, the Doctor was reunited with his first two incarnations and after saving the universe once again he was rewarded by returning his ability to fly the Tardis. We would also see him paired up for the first time with the most famous companion of them all, Miss Sarah Jane Smith. We would also be introduced to the Doctor’s most menacing adversary, The Master. The outspoken, opinionated, and totally feminist (though contrary to some of her later wardrobe choices), this young reporter would steal the hearts of not just one but three Doctors and the people of Britain. Her first serial also saw the introduction of a famous Doctor Who villain the Sontarans. A little less likely to scream for no reason and much more likely to take charge of the situation on her own, Sarah Jane Smith became so popular that after leaving the show, she would end up starring in two different Sarah Jane Smith spin off series. It’s a terrible shame that Elizabeth Slaton cannot be with us to celebrate the 50th anniversary this past year. 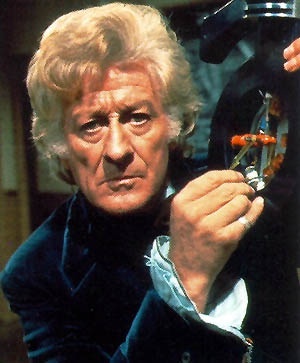 It said that no one loved being the Doctor more than John Pertwee. So much of his personality came out through the character and right, during a fun time as color television was finally becoming commonplace many people’s homes. With that came a fun and vibrant Doctor Who and perhaps more wardrobe changes than any other doctor is ever gone through. There is no one on this planet more recognizable as the Doctor than Tom Baker. Even if you know nothing about Doctor Who, just seeing that impossibly long multicolored scarf instantly conjures up the concept and idea of Doctor Who. The great Bohemian and traveler, the fourth Doctor had perhaps the most eccentric personality of them all. The show likes to explain it by saying that the Doctor’s regeneration from the third to the fourth was a bit traumatic and as such it affected his personality. The truth is, that’s just Tom Baker. When you watch the fourth Doctor go about his adventures you are truly watching is Tom Baker… and I wouldn’t change it for anything. Loud, bombastic, strange to say the least this Doctor was certainly the most alien. This Doctor constantly found himself to the wrong place at the wrong time, facing off some of the universe’s greatest threats. Yet with a pouch of Jelly Babies in his pockets and a skip in his step, he would always overcome evil. During the fourth Doctor’s time, we found him spending more time at home, even serving as President of the Time Lords at one point. Facing the impossible choice of either wiping out the entire Dalek race or creating the events that started the Great Time War (a little foreshadowing, it doesn’t end well either way). We also finding him pairing up with fellow Time Lady Romana as the show explored its first series-long story arch. By far one of the busiest of all the incarnations. I love this little metal dog. K-9 was perhaps one of the Doctor’s best friends. Smart, feisty, loyal, and self-sacrificing, it was everything you wanted out of a dog with the added advantage of having a laser installed in his nose. There would be a few different versions of this little guy, some that would stay with Doctor and others that would go off on adventures with with companions as they left the show. One of my favorite moments in recent Doctor Who history involves the return of K-9 in the episode Class Reunion with David Tennant, the tenth Doctor. 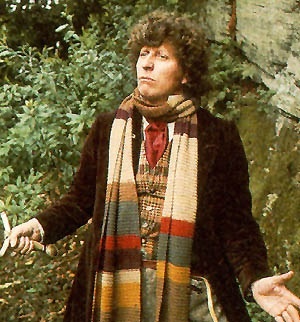 Tom Baker played the role the doctor longer than any other actor. His epic seven-year run has yet to be matched, and he continues to provide the voice of the fourth Doctor in a variety of different forms of media, including radio series. Every poll I’ve ever seen he has always listed number one in terms of people’s favorite Doctor. When asked the question: who was your first Doctor? Tom Baker was mine. Now that you have very basic understanding of why the first four Doctors are so phenomenal, go off and get a start on them. Netflix, iTunes, and Amazon have a variety of serials from each. Or wait until until part four of this guide when I tell you how to watch them all! Tune in next time when we look at the remainder of the classic Doctors.